Chileans living in Petorca say avocado growers are hoarding water illegally while residents are left with nothing. The Petorca province in the Valparaiso region of Chile is one of the avocado capitals of the world, and avocados are in a boom time. The world canât get enough of the fruit. In Petorca, many avocado plantations install illegal pipes and wells in order to divert water from rivers to irrigate their crops. As a result, villagers say rivers have dried up and groundwater levels have fallen, causing a regional drought. Residents are now obliged to use often contaminated water delivered by truck. It takes 2,000 liter (528 gallons) of water to grow just 1 kilogram (2.2 lbs) of avocados, which is roughly two medium-sized avocados. Thatâs four times the amount of water needed to grow the same volume of oranges, another notoriously thirsty crop. âPeople get sick because of the droughtâ"we find ourselves having to choose between cooking and washing, going to the bathroom in holes in the ground or in plastic bags, while big agri-businesses earn more and more,â Veronica Vilches, a water activist responsible for one of the Rural Potable Water systems e stablished to address the shortage, told the Guardian. Chile exported nearly 224,000 metric tons of avocados to the world in 2017. 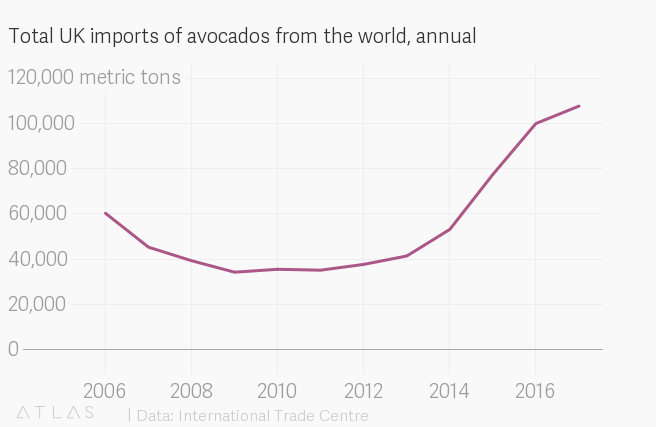 Europe imported some 134,000 metric tons of those avos, or about 60% of that total. The UK, meanwhile, is responsible for consuming roughly 14% of the European total, or 8% of Chileâs total avocado exports. The UK is home to roughly 9% of the population of Europe, so theyâre certainly eating more avocados per capita than some other Europeans, but the yâre far from the main culprits; it seems Europe as a whole is hungry for Chilean avocados. 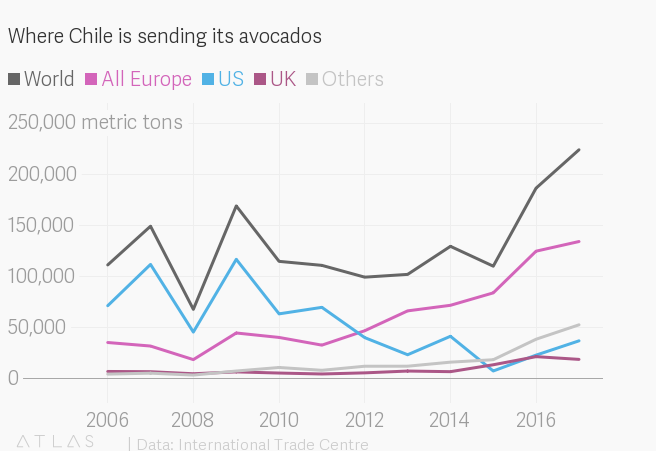 The US imports 16% of Chileâs avocados, far less than Europe. But thatâs probably not because the US has lost its infamous taste for avocados. More likely, itâs because the US has its own very own avocado source: California produced 98,000 metric tons of avocados last year. And is California alone doesnât quench the American thirst for avocados, it can always turn to its neighbor to the south to fill the gaps.